Day trips and cruises on the Göta Canal! Don't hesitate to call or e-mail us! 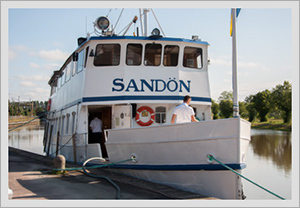 Welcome aboard M/S Sandön. Join us on a journey through Swedish history and see what Göta Canal has to offer. We pass through magical forest, lakes and farmlands. Our ship was built in 1910 and is the oldest Göta Kanal day trip vessel. A tour with us is not only a transport but a convivial experience for both young and old. We have preserve the old atmosphere that only a really old ship has but with comfort and functionality in mind. I sommar har du möjlighet att resa delsträckor med oss. Gå på i Forsvik med din cykel och cykla sista biten. Rent a room in central Karlsborg! When it comes to conferences, staff parties, weddings, birthdays, business meetings, association excursions and so on, a boat trip is an excellent choice. Our Ship are available to charter all year (with regards to weather and timetable). Minimum time are 2 hours. 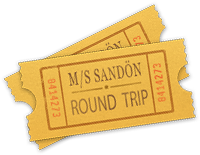 M/S Sandön was built in 1910 in Gothenburg and on board you find a convivial atmosphere. Even in cold weather, the ship is warm an cheerful. The ship is suited for wheelchairs, we have a full equipped restaurant kitchen and 130 restaurant seats. Contact us for suggestions on cruises. Our chef will help you compose a delicious menu. Saturday 29/6 , 13/7 , 27/7 and 10/8. We sail thru the lock in Forsvik up to lake Viken and pass thru the most beautiful parts of Göta kanal we serve evening buffet and we have an entertainer onboard . ** The Saturdaytour 11.00-15.00 . This trip is the same as the eveningtrip . OBS!!!! The OBS!! 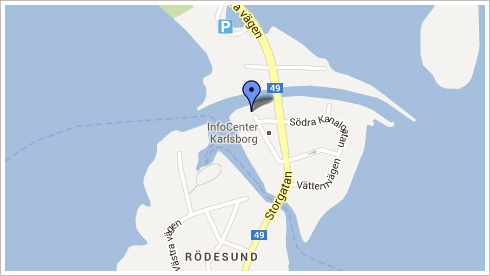 The connection to the tour on thursday afternoon is before the boatrrip and leaves Öltappens parkingplace 12.45 . The bus is for free and you pay the ticket for the boattrip when you come onboard the ship . Cancellation made ​​30 days before departure without charge. 30-14 days 50% charge. Thereafter the full fee. The ship is suited for wheelchairs, we have a full equipped restaurant kitchen and 120 restaurant seats. Printer-friendly version of the timetable. In Karlsborg M/S Sandön departure near the canal bridge. In Töreboda M/S Sandön departure from the canal behind the railway station. Göta Canal is Sweden's largest construction project ever made. 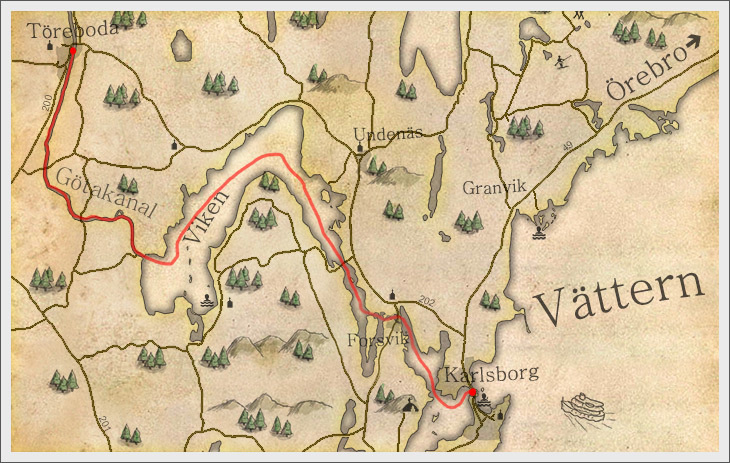 On April 12, 1810 Baltzar von Platen got permission to start building the canal from Mem on the east coast to Sjötorp next to lake Vänern. Baltzar von Platen died three years before the canal was opened in Mem year 1832. Göta Canal is 190.5 km long and the difference in level is 91.8 meters. The highest point at the canal is lake Viken where M/S Sandön travels. Overall, the canal has 58 sluice. The sluice with the greatest level difference is in Forsvik where also Sweden's oldest iron bridge (inaugurated in 1813) still can be seen next to the sluice. 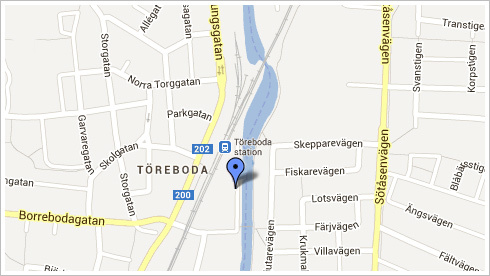 The sluice at the canal with the lowest level difference is in Tåtorp. This lock opens and closes with manpower and the level difference is usually around 30cm. Both Forsviks and Tåtorp sluice we pass on the M/S Sandön as we travel between Karlsborg and Töreboda. Read more about Göta Canal on wikipedia or visit Göta Kanalbolagets webpage.